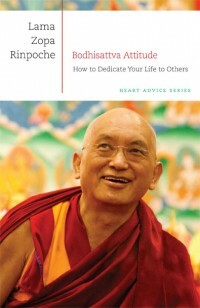 Bodhisattva Attitude: How to Dedicate Your Life to Others, the first in Lama Yeshe Wisdom Archive’s newest Heart Advice series, is unique because it is based from Lama Zopa Rinpoche’s experiential “heart advice.” Focusing specifically on bodhichitta, the altruistic determination to achieve enlightenment for the sole purpose of enlightening all sentient beings, the book is not merely about what bodhichitta is and why one should develop it, but rather it is about how it can be developed and integrated into every moment of one’s life. Bodhisattva Attitude has four sections. The first contains verses written by Shantideva, arranged by the great lama Kachen Yeshe Gyaltsen and with very slight modifications by Rinpoche, to be read each morning and lived throughout the day. The second and third parts comprise teachings on four motivations and the actual motivations themselves, complied according to Rinpoche’s advice and keeping closely to his words. The fourth and final part is an extensive appendix containing a remarkable amount of materials to support the understanding and practice of the previous motivations, including mantras, additional prayers, and mindfulness exercises to transform “ordinary” activities into spiritual practice. Perhaps the most appealing aspect of this book is that it is edited in such a way as to preserve the reader’s sense that Rinpoche is directly giving counsel: “Pray to become healing for sentient beings like this great medicine. Then pray to become like ‘a wish-granting tree.’ … It is great to pray to become like this for sentient beings. …When you need to abbreviate the verses even more, you can just read these last two verses. Even that much is very good.” This sense of receiving Rinpoche’s “direct” advice, even though through an indirect medium, is truly a generous editorial decision. 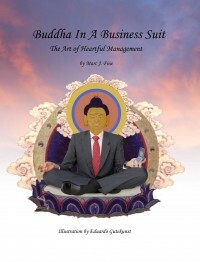 And perhaps even more generous, the students of Amitabha Buddhist Centre in Singapore have sponsored the book’s production, allowing the first printing – 6,000 copies – to be offered freely to the public. 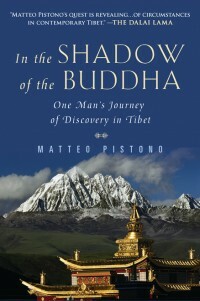 Author Matteo Pistono skillfully tells the interweaving stories of his spiritual quest, political work and travels to remote areas of Tibet in his book In the Shadow of the Buddha, recently released in paperback. The author’s high-stakes adventures, which take place over the course of a decade, are by themselves riveting. But add to the mix a fascinating profile of an historic Tibetan master and a frank account of human rights abuses and you get a page-turner that has real substance. In his twenties, Piston launches into a pilgrimage in Tibet to trace the steps of Terton Sögyal (1856-1926), a highly regarded Buddhist spiritual master who also advised and taught the 13th Dalai Lama. Terton Sögyal’s ability to combine high-level Dharma practice with politics attracts Pistono, who had been deeply involved in political campaigns in his young twenties. As Pistono goes about his pilgrimage in Tibet, seeking to develop his Buddhist practice, he encounters many Tibetans asking him to smuggle out documentation of Chinese oppression and human rights abuses, which he does. As the years unfold, Pistono manages to both continue with his pilgrimage while also helping reveal the harsh conditions that contemporary Tibetans face. But it’s not an easy journey for Pistono. One of the most compelling aspects of Pistono’s book is his honesty, both about his spiritual practice and also about the doubts and challenges he faces. More than anything else, In the Shadow of the Buddha tells how a sincere Dharma student becomes inspired to courageously take on the difficult work of self-transformation, and in the process, helps to make a difference for Tibetans living in Tibet. Not all of us can trek to the remote high plateaus of Tibet, but we can become inspired to see how our Dharma practice can happen off the cushion and in the world around us. As a side note, Pistono’s early encounters with Buddhism took place at Kopan Monastery, where he did a meditation course in the ‘90s. Currently, Pistono serves as the executive director of Nekorpa, a nonprofit organization that seeks to support pilgrimage through the preservation of sacred sites, stories and texts as well as through the recognition and support of individuals who ensure this ongoing spiritual heritage. Buddhist psychology posits that our problems come from within our minds, not from external situations. 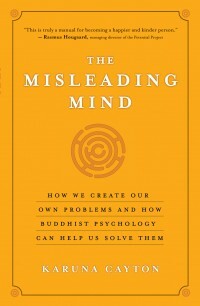 The Misleading Mind helps the reader recognize the ways in which our minds perceive reality and react to it – and how we are mislead in the process. With exercises and examples from over 20 years of experience as a psychotherapist, business psychologist and coach, Karuna Cayton lays out a road map for those wishing to foster more balance and happiness in their lives. This book will be of special interest to students of Lama Yeshe and Lama Zopa Rinpoche. Cayton’s shares his personal stories of the Lamas, recounting their wisdom, which often came in a few well placed words, as a way of underscoring some of his points. While Cayton does include Buddhist teachings, like the Four Noble Truths, it is done with a light touch. With its down-to-earth language and practical methods, long-time students and non-Buddhist alike will find this book helpful. 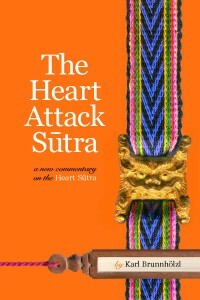 When the Buddha revealed the Prajñaparamita sutras, teaches Karl Brunnhölzl, the arhats in attendance, “were so shocked by what they were hearing that they died on the spot.” The Heart Attack Sutra seeks to preserve this same spiritual shock for Western minds (but perhaps without the grim consequences that Buddha’s earlier students had to face!) by presenting and commenting in detail on the Heart Sutra, arguably the most well-known sutra in the Mahayana tradition. Brunnhölzl begins by contextualizing his commentary with rich introduction to the concept of emptiness and dependent origination in Mahayana though, the three cycles of the Buddha’s teachings, the figure of Lady Prajñaparamita and the genre of literature within which the Heart Sutra falls. Next follows the actual line-by-line commentary, a meditation on Lady Prajñaparamita and the Heart Sutra itself from the siddha Darika, and Brunnhölzl’s translation of the sutra for reference. Karl Brunnhölzl, conferred the degree and title of Khenpo by Dzogchen Ponlop Rinpoche at Nitartha Institute in the summer of 2010, offers another fascinating and clearly written addition to the growing number of commentaries on the Heart Sutra written by Westerners. Heavily influenced by Tibetan and Indian cuisines, Nepali food is simple, flavorful, healthy and hearty. 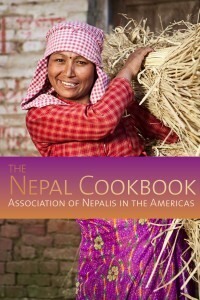 The Nepal Cookbook a collection of family recipes from over 50 contributors, offers easy to prepare recipes for experienced chefs and beginners alike with special cooking methods and unfamiliar ingredients (to Westerners) fully explained. In the West, we often place more importance on our external success – career, marriage, children; than on our internal success – than on how much happiness, kindness, clarity we experience internally.